First Line:" The problem with fairy tales is that most of them begin with tragedy." Review: So many feels! I literally had no intentions on reading Cinder & Ella, the cover kind of threw me off I didn't really care for it, and I know shame on me for judging a book by its cover BUT give me some credit I did eventually buy it thanks to not being able to escape the book ... I swear for a month after I came across Cinder & Ella I kept seeing it everywhere so I bought it and loved it so very much. I was laughing and smiling and there were tears (I'm one of those weird people that just doesn't cry over books and this book was the first one to ever bring that out of me) I was just a bag full of emotions while reading it and even now I'm having issues putting coherent thoughts together. Ella has been through hell and we are thrown right into it. Ella and her mother get in a car accident, one that ends up killing her mom and disabling Ella along with most of her body suffering from burns from the accident. I felt for her so much, I was so angry for her and sad and happy, everything she felt, I felt. There is a lot of pretty heavy topics touched in the book such as bullying, depression, divorce, death and much more. Cinder Brian this guy! He was just an all around awesome best friend to Ella. Totally swoon worthy. He is famous, a heartthrob but he has his own problems, he isn't in control of his own life and thanks to the dual point of view it was easy to connect with him as well. Oh and the guy reads! 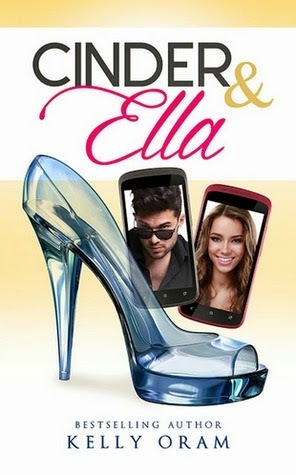 Yes he met Ella on her book and movie review blog so believe me when I say he easy to fall in love with. Then there was her family, her new family. After her mom passed away she had to move in with her dad who abandoned her when she was just a little girl. Believe me when I say you will hate him for majority of the book, there is so much I want to say but I think it will be spoilerish and remove the shock factor. There is also the "evil" step sisters, although one eventually came around while the other was truly a nasty piece of work. As for the step-mom, you can tell she had good intentions she was just rather clueless on how to go about it. Even though things were pretty bad in the beginning I like how it all worked out in the end for everyone involved in that household. Overall Cinder & Ella is a perfect in-between book. It's a fast paced read, it dug deep while still being a fun read with all the stuff that just makes you feel good while reading an incredibly amazing book.